On January 30th the exhibition Thomas Cole’s Journey Atlantic Crossings opened at The Metropolitan Museum of Art. The exhibition celebrates one of America’s leading landscape painters, Thomas Cole (1801-1848), who first immigrated to the United States 200 years ago. He continued to cross the Atlantic multiple times, including a return journey to England in 1829-1831, a trip to Italy in 1831-1832, and another trip to America, specifically New York, from 1832-1837. Designed to highlight these travels the exhibition is arranged in six sections including, Industrial England, American Wilderness, London: Imperial Metropolis, Italy: The Grand Tour, Consummation, and Cole’s Legacy. The first gallery, Industrial England, contains works that give insight into the world in which Cole grew up. He lived in England at the height of the Industrial Revolution as the factory system and machine processing were on the rise. Urban life was booming and this can be seen in the art of those before him. 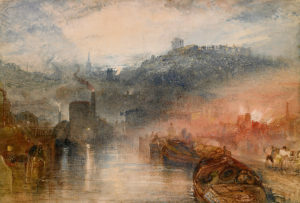 Included in this gallery is Dudley, Worcestershire by Joseph Mallord William Turner (1775-1851) which depicts the new industrialized city. From the point of view of a busy canal port, we can see smoke stacks in the background and pollution entering the atmosphere. In viewing landscapes such as this we can see the harsh juxtaposition between the place that Cole grew up and the tranquil nature scenes that he later painted. In 1818, Cole and his family immigrated from Liverpool to Philadelphia and later, in 1825, relocated to New York. Already yearning to be a painter, Cole took lessons and studied historical greats. 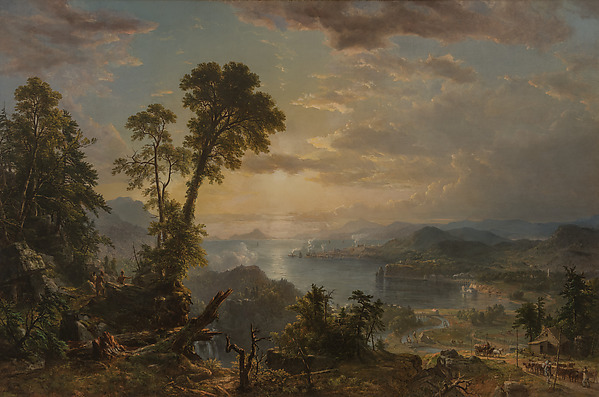 During his first summer in New York he took a steamboat up the Hudson River where he began his exploration of the American landscape through painting. 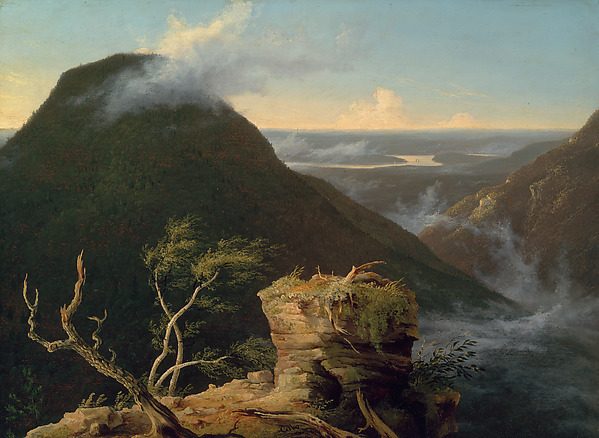 The great 1827 oil painting View of Round-Top in the Catskill Mountains is a prime example of the style that Cole has become so well known for. Devoid of all human interaction his landscapes were the opposite of the England in which he was raised. Cole’s relationship with the American wilderness would influence generations of artists to come. Cole arrived in London in the summer of 1829 to study the artists of Europe and paint the land of his birth. There he created works of art that boldly contrast his quiet landscapes of America. Effect for Newstead Abbey, Nottinghamshire, England, an 1830 work, completely lacks color. 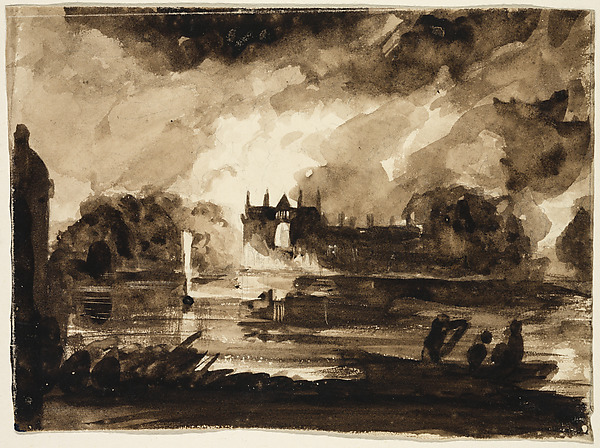 The clouds in the sky are dark and dangerous, the figures in the foreground appear as silhouettes. The work greatly contrasts View of Round-Top in the Catskill Mountains but echoes paintings by his predecessors, such as the earlier discussed Dudley, Worcestershire by J. M. W. Turner. In the summer of 1831 Cole traveled to Italy where he resided in Florence, the Tuscan countryside, and Rome. It was in these places that he expanded his skills by focusing on the human figure and sketching while visiting important classical and Renaissance landmarks. In Interior of the Colosseum, Rome the viewer enters the great Colosseum, desolate and overrun with green flora. 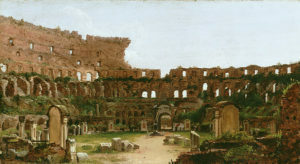 It is in this painting that Cole combines his interest in England and America as the man made structure of the Colosseum is reclaimed by nature. In 1832, Cole returned to New York and worked heavily in the Catskills to produce some of his most iconic works that would continue to influence generations of future artists. He took on students and established a tradition of landscape painting later know as the Hudson River School. The pictured oil on canvas by Asher Brown Durand painted in 1853 shows Cole’s legacy. Progress (The Advance of Civilization) speaks directly to the environmental issues tackled in his works — the left side is peaceful wilderness juxtaposed by the figures on the right and enhanced by the title. Cole painted to illustrate the beauty of the wild Earth and as manifest destiny, the expansion of the United States throughout America, increased in popularity the importance of his works grew. Cole died at the age of 47 leaving a great legacy to be remembered and studied by painters and scholars for decades to come. The exhibition will run until May 13, 2018. For more information visit the exhibition website here. A catalog was produced in conjunction with the exhibition and can be purchased through the Met store.